Very cute and sturdy! Has held up great for over 1 1/2 years!! Very soft and helps with leg fatigue. It also cleans up well, if spilled on. Would absolutely recommend! Mohawk Rules With Utensils Dri- Pro Comfort Mat (1'6 x 2'6) - multi - 1' 6" x 2' 6"
Fashion and function meet in the Impressed Home Sweet Home Kitchen Mat from Mohawk Home. 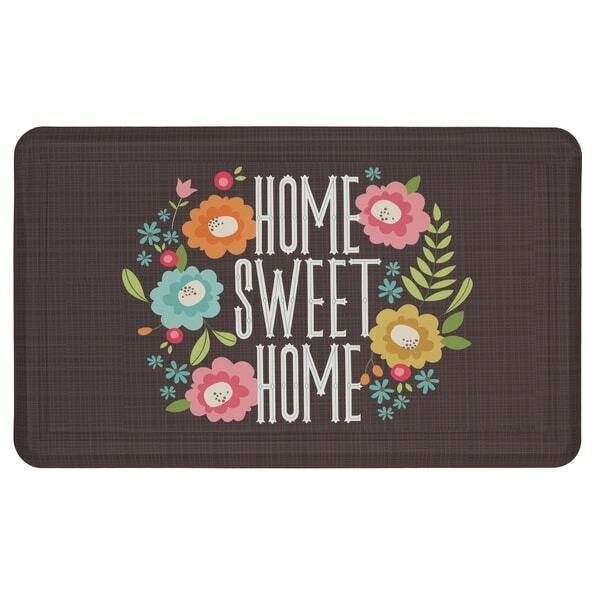 Featuring sweet springtime inspired blossoms on a brown cross-hatch patterned base, this mat will add both beauty and brilliant design to your kitchen. Feel the luxuriously soothing comfort for yourself with the premium plush cushion core. Mohawk Home' s advanced anti-fatigue technology offers welcomed relief from back, leg and foot discomfort often caused by standing on hard surfaces. Exclusive Dri-Pro technology is essential for tackling spills; simply wipe away moisture and messes. This mat is consciously crafted with a stain resistant polyester face and polyurethane skid resistant backing. Dimensions 30.0 In. X 18.0 In. X 0.5 In. This mat is so comfortable to stand on. I use it at my stove while I am cooking. I have had it for over a year and it has held up well and is easy to wipe clean. Very cute, nice colors. In love with this mat. Very uplifting in my kitchen. "Is the background solid brown, or does it have some type of pin stripes? Are the pin stripes blue?"